Students become "language models" for each other in two-way programs. Pointing to photos of Abraham Lincoln and George Washington on a classroom easel, Judy Vera asks her kindergartners at Salt Creek Elementary in Chula Vista, CA, to identify “una diferencia” or “una semejanza” between the two presidents. Speaking in English, a boy sitting on the rug in front of her talks about Washington fighting a war. Vera responds in Spanish and uses her fists to make fighting motions — a strategy called total physical response and one that is regularly used when children are learning a second language. In kindergarten, it’s not unusual for native English speakers in this dual language immersion classroom to have receptive language — they understand the Spanish their teacher is speaking, but they’re not quite ready to express themselves in the language. In a few years, however, the students will be switching back and forth between Spanish and English with ease. 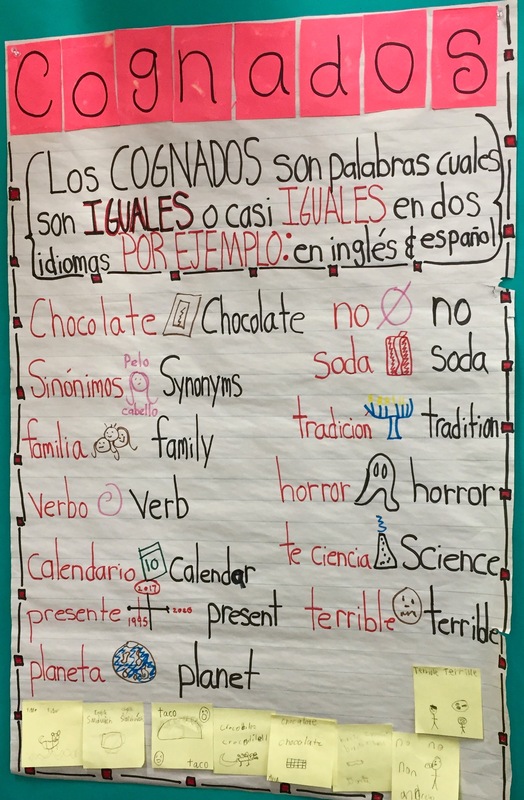 A wall chart showing cognates. Salt Creek is one of 10 schools in the Chula Vista Elementary School District (CVESD) that uses a 90-10 dual language model in which only 10% of instruction in kindergarten is in English, gradually increasing to a 50-50 split by 6th grade. Another 10 schools in the district have a 50-50 model from kindergarten through 6th grade, and determining which is the best fit for each school is one of the important issues for district and school leaders to consider when deciding to implement a dual language program. Located south of San Diego, just a few miles from the border with Mexico, CVESD began implementing its program almost 20 years ago after a charter school, Chula Vista Learning Community Charter (CVLCC) School, opened with a Spanish-English dual language program. Launched at a time when California schools were required to eliminate bilingual programs under Proposition 227, the program became a model for a district in which schools now have waiting lists of parents who want to enroll their children in a dual language classroom. Proposition 58, passed in 2016, removed the English-only requirement. With English learners (ELs) making up more than a third of the district’s 29,600 students, leaders say the program is also a vehicle for making sure students who speak Spanish at home are developing the same content knowledge and skills as their English-speaking peers. “For us, it’s a pathway to closing the achievement gap,” Sanchez says. The percentage of ELs meeting or exceeding state standards in English language arts has continued to climb, from 42% in 2014-15 to 51% last school year. In a 2017 report, Amaya Garcia, a senior researcher with New America’s Education Policy program, described some of the lessons learned from the district’s experience. “Chula Vista provides a good example of how to scale up dual language immersion programs by paying attention to community input, how to partner with local higher education to gain well-prepared bilingual educators, and how to prepare all teachers to facilitate ELs’ language development,” she wrote. With society and the workforce increasingly viewing the acquisition of a second language as an important asset, the number of schools with dual language immersion programs is steadily growing. “What was once seen as a deficit is now a jewel,” says Lalaine Perez, principal at Salt Creek. In New York City, for example, Department of Education officials announced plans to open 33 dual language pre-K programs next school year, and outgoing Chancellor Carmen Fariña says pushing for more dual language programs in the district has been a major priority for her as well as an important way to connect with families. In Washington, school districts can apply for $200,000 grants to offer dual language programs under a law Gov. Jay Inslee signed last year. The Center for Applied Linguistics (CAL), based in Washington, estimates that roughly 2,100 schools now have dual language programs. But José L. Medina, the director of global language and culture dducation at CAL, says that if schools are opening these programs just to keep up with a trend and not taking the time to plan them well and become familiar with the guiding principles, they might run into difficulty. “If a principal and an assistant principal don’t know best practices, there is little chance that all the benefits will be reached,” Medina says, adding that district leaders “need to be knowledgeable about the latest research.” Too often, he adds, there are “pockets of greatness” in a district because of strong teachers, but districts can’t really have a program “without having people at the administrator role” involved. Administrators, he says, need to know what kind of model their schools are implementing and what subjects are taught in what languages. They also need to make sure that that any additional literacy intervention strategies — for students with disabilities for example — are delivered in the same language in which they are learning to read. “Why would you serve [students] in the language not of instruction?” he asks. Medina adds that it can take at least a year to plan a strong dual language program, which includes planning professional development and working with human resources to recruit well-qualified teachers. CVESD has built relationships with local universities to help meet its needs for bilingual teachers. One of the biggest challenges for dual language programs — even Spanish-English models — is finding quality curriculum materials, Sanchez says. 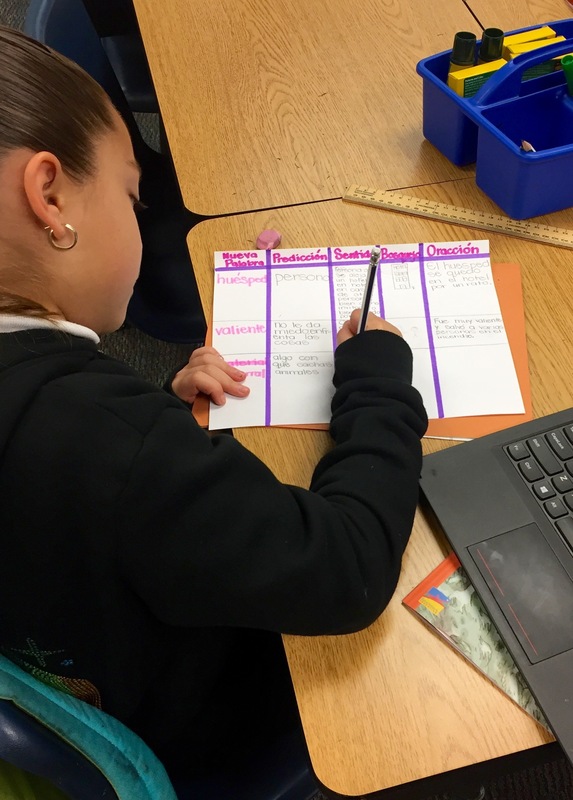 Until CVESD adopted its new English language arts materials from Benchmark, which offers a complete parallel set of materials in Spanish, teachers were developing their own Spanish instructional materials. Medina adds that materials can’t merely be translated into the partner language; they must be authentic. A student completes a Spanish assignment. District and school leaders, Sanchez says, also have to market their dual language programs — not just to English-speaking families, but to Spanish-speaking households. In this growing district, which is planning to add 11 more schools over the next several years, there is strong support for dual language immersion, but students who are learning Spanish need to be able to interact with native speakers. Ideally, Sanchez adds, classrooms are evenly split between native English speakers and native Spanish speakers, but it doesn’t always work out that way. Neighborhoods with more English learners, she adds, tend to prefer a 50-50 model because they want to make sure their children are learning English, and in a 90-10 model, parents of native English speakers have to be willing to “stay the course” in order for their children to become literate in both languages. Studies have found that in 90-10 or total immersion models, students are naturally behind their peers who have only been learning English on skills such as capitalization, spelling and punctuation. But by the later elementary grades, those differences disappear. How to enroll children in the program is another matter school leaders might need to address. At Salt Creek, students were originally admitted on a first-come, first-served basis, but then the program grew so popular that parents were lining up before dawn to gain a spot. Perez says leaders didn’t want the program to be limited to families with more resources — who might pay someone to stand in line for them. “That’s not something you want to force your community to do,” she says. So now a lottery is used to enroll students and spots are reserved for younger siblings when they start kindergarten. At CAL, Medina is happy to see his native language increasingly valued by schools instead of being viewed as a weakness and for students to have opportunities to be “language models for each other.” Moving from Juárez, Mexico to El Paso as a young child, Medina only spoke Spanish and was deemed too immature to attend kindergarten because he would kick, bite and run out of the classroom. As a 1st grader in a Catholic school, he was strapped to a gurney and rolled into his classroom because he couldn’t calm down. A teacher also changed his name to Joe. School leaders also have to put thought into pairing teachers who share students as part of a 50-50 split, in which they might alternate weeks with students or swap in the middle of the day. These partnerships allow for ongoing joint lesson planning and complement district-provided professional learning opportunities. “My partner and I plan the same writing,” says Nancy Holmes, a kindergarten teacher at Loma Verde Elementary in CVESD who teaches in English and shares students with Spanish kindergarten teacher Efrain Lopez. 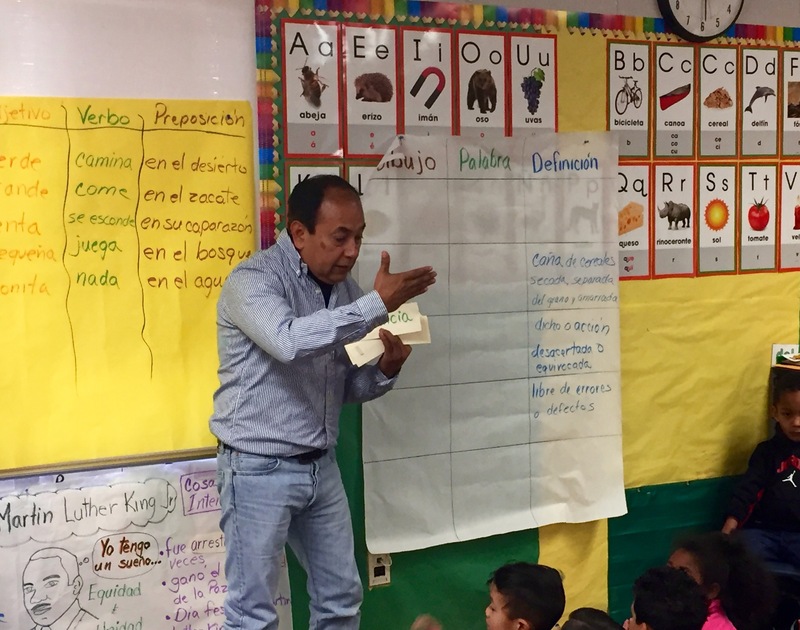 In the classroom next door, Lopez leads students in a Spanish vocabulary lesson, handing out words on cards to students when they accurately match them to definitions written on a large sheet of paper. Similar posters hang in classrooms throughout Loma Verde and Salt Creek and are part Guided Language Acquisition Design, an approach that focuses on going beyond basic conversation skills to build academic content knowledge in a second language. Kindergarten teacher Efrain Lopez leads a vocabulary lesson in Spanish.